Hope's Cafe: VOS Flips Review!! I'm really not much for wearing flip-flops or sandals. At least, I never did, until I tried on a pair of VOS Flips. These are seriously THE most comfortable flip-flop-type shoes I have ever worn! I love the design, with a crossover band instead of a thong. (I never understood how people could think a thong between their toes was tolerable, let alone comfortable!). They have a thick sole, and are made with natural rubber (cultivated from the Heva Brasilensis tree); so these flips are 100% recyclable, and eco-friendly! The sole has tire traction, which provides a much better grip than normal flip-flops. Honestly, these are so comfy and yet stylish at the same time. I wear them a lot, even running around town-which is not something I normally do in sandals. VOS Flips are available in 6 different colors, for both men and women. I chose the Cielo, which is a blue/black two-tone combination. After saying all that, there is even more to love about VOS Flips. VOS has partnered with Soles4Souls, and has committed to giving away one pair of sandals to someone in need for every pair they sell. Wow! Since 2005, Soles4Souls has given away over 7 million pairs of new and gently used shoes. They are currently donating one pair every 9 seconds! VOS is presently focused mainly on Guatemalan under-privileged communities, especially the rubber-producing companies that cultivate raw materials used in VOS Flips. At the same time, VOS is working with the Gremial de Huleros and AgroSalud, assisting over 500 workers (and their families) with health care, education, and living conditions. That's A LOT of giving and caring for a small company! I really admire VOS' dedication to helping those in need. The vision for VOS started in Brazil 10 years ago, when Jose Alejandro "Bati" Flores saw the potential in a sandal not readily available in North America. "Over the next decade, he coupled this initial vision with his lifelong exposure to the developed and developing worlds, his involvement with the sport of soccer and his keen consciousness of the natural environment that surrounds our daily lives. BATI [pronounced bah-tea] is the Founder of the VOS brand and is more formally known as José Alejandro Flores. He is an entrepreneur by nature; having the advantage of also applying his invaluable knowledge acquired by his multi-national corporate experiences over the years and his International MBA. Philanthropic principles are ingrained in his personal and professional values, which in turn he readily applies to his vision of the VOS brand. 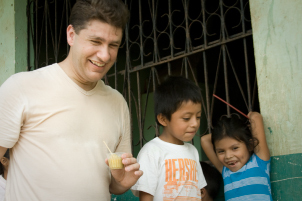 The commitment to be an environmentally conscience brand along with contributing to the social responsibilities amongst global communities in need, are done in a manner that is second nature to him and his organization.Having charismatic parents of both U.S. and Guatemalan nationalities has provided BATI with an identity benefit, exposing him to a culturally diverse environment his entire life. He has utilized this identity benefit as an inspiration for the creation of the VOS brand, infusing his ongoing life experiences in both the developed and developing worlds. His first-hand awareness of the endless array of issues that our global communities face, led to the simple but profound question: Can you afford to care?Hence, VOS has now been launched and with a cost-per-pair-of-flips of only $19.95, Jose Alejandro is proud to say he's made it possible for people to "afford to care." If you're looking for some athletic sandals, or would just like more information about VOS Flips and their incredible mission, check out the VOS Flip website today. I guarantee you, if you try a pair of Flips...you'll fall in love with them just like I did!